Again, what did Ferrari actually do? All I've seen is the story about them asking the FIA for clarification (as to whether flags trump lights, and whether a green flag was indeed being waved). Trust me, I don't normally need a reson to assume Ferrari are being unsportsmanlike, but I wouldn't mind knowing what they've done! As an individual incident, the cutting of the seal on Massa's gearbox is probably most unsporting for me, although I really don't have that much a problem with it and thought it was pretty clever at the time. The main thing to dislike was the effect it had on other drivers. I am genuinely uncomfortable however with Torro Rosso drivers being expected to hop out of the way of RBR at all times. I know it generally hasn't affected too much overall, but I still don't like it very much. They are just Ferrari and Alonso drives for them. That's enough for most people around here, don't ask for a logical explanation, you won't get it. They have a rulebook and it says that the flags are important (on the equal level with light boards around the track), the dashboard in the car is irrelevant. No need for any clarification (we as lowly amateur were able to call this right after less than a day and they weren't? I find this hard to believe). The problem was that they was under fire in Italy and Spain for not "protesting" and ithere was one simple thing they could do - make an official statement that they saw the evidence and it shows that the pass is not illegal. That would have been enough to calm down their rabid fans. But no, they had to hide behind FIA's back. No wonder Bernie is tiddled and I'm sure FIA is not thrilled with them too. The request for "clarification" was the cowardly thing to do when knowing too well there is nothing to clarify. I can't see what else they were supposed to do myself, given the pressures on them, but fair enough. Thanks for responding. I dunno why people are getting so worked up about the gearbox thing, because of the rules and they way they are written We have no idea if any team has ever broke a seal for the sake of breaking the seal. The teams don't have to announce or tell the FIA why they are breaking a seal and I would Doubt if a FIA Judge of Fact would be allowed to go running to the media if a team just broke the seal. So we have no way of knowing if every gearbox penalty before Austin was a genuine one. The rulebook doesn't say that. For a team, Ferrari pouring cold water on what should be a celebration to end the season. Extremely selfish, self-centered, and childish behavior. For an individual, Hamilton taking the fight to Vettel and messing up his race at Germany, even though he was a lap down. A dirty trick driven by ego and extremely selfish, self-centered, and childish behavior. Mclaren spygate and the 'driver' who leaked it. This thread is now a prime contender for the most predicable thread of the 2012 season... both in it's content and in who is making what claims! Ah, the dastardly X cars, the evil X team, the sinister X driver.... the epitome of evil doing what comes naturally... cheating, cheating and .... more cheating. Some of you need to understand that the old saying "if ya ain't cheatin', ya ain't tryin'" is truer than any of you realize. Teams are going to "cheat", always have, always will. Not just some teams, not just teams from certain nationalities, not just the top teams. Things such as "team orders" or the overblown "seal" incident are a part of strategies, as is pulling your driver in to let your best chance for the championship. This is a team sport, and as long as there is more than one car required of a team, it will continue to be so. We may see some of their actions as being unsporting, but in reality, that is our problem, not theirs. These teams spend 100s of millions to get results and to maximize exposure for their sponsors. As long as they are not breaking rules, it is legal even if we as fans see it as "shady". Is it cheating? NOPE... Is it smart? If it helps maximize your situation, YES. Are we always going to like it? NO. As for the "protests" or "clarification requests"... so what? Teams have that right, and they have been done repeatedly in recent years for what we might well call "unsporting purposes"... look at all the technical innovations that have resulted in requests for "clarification"... Some of those proved to me nothing more than a disruption or distraction, some have resulted in near immediate actions in "spec" changes, and some have led to rule changes. It is what the teams have available to them, and their use of these processes is not necessarily underhanded. My point is that we can all want the sport, the stewards, the teams and the drivers to be squeaky clean, to never make a mistake, to never do anything questionable, to always show great sportsmanship (as we define it), but like most of life in general, that is not going to happen... it just ain't human nature! And before you fire away, let me say that I am not saying that all the points listed in this thread are honorable actions, as they certainly are not. Nor am I saying that we don't have a right to cry about them, we do. What we do need to do is keep them in perspective and accept that our own biases (yes, we all have them) affect how we view each situation. What driver would that be? NO driver leaked "spygate", time for you to do some research and learn a little bit about the event... from the start. Spygate was well publicized and a full-blown scandal well before the situation that I suspect you are referring to happened. 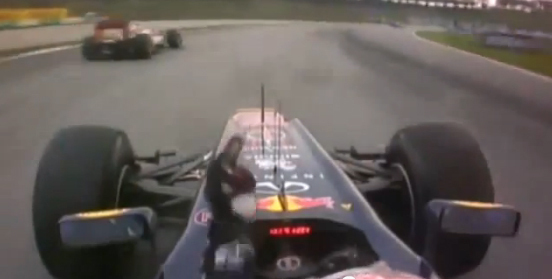 No 1 in my ranking: Vettel showing HRT middle finger in Malaysia 2012. If you were MSC, taking into account all the history they have together, would you want to impede Vettel on his way to a 3rd title? I don't see the surprise here, that Merc wasn't even a match againt a damaged RB8 anyway. They didn't always jump out of the way, but then again Toro Rosso struggle even to get into the points, so why would they put a huge fight to a top running car from their sister team? Especially since the TR drivers are auditioning for a RBR drive. You have to be a bit dense to expect them to hold up the RBR drivers especially if theirs a WDC/WCC on the line. Ferrari complaining about Vettel's pass after the season's end. At first I thought it was just a case of sour grapes, but I can see the confusion regarding all the lights and flags. I went through that entire thread on here and got a pretty good understanding of what was going on. Either way, case closed now. Bring on 2013! Just a precaution by RBR, Vettel was fighting for the title, & Webber was saying all weekend he won't move over for Vettel. RBR's hands were tied, they don't want another Turkey 2010 so late in the season. You can't blame a team for being smart about how they do things, would you rather them just be blatant like Ferrari is with Massa? On that note, how many points has Massa gifted Alonso under team orders vs Vettel & Webber? I don't think Ferrari were responsible for the furore that ensued. It's my understanding that they sought a clarification from the FIA and they did so privately. It was the media outlets, particularly AS, running with the story. Having said that, whether I have a problem with Ferrari querying it depends on how they viewed the situation. IF they watched the footage and were genuinely of the opinion that a green flag wasn't visible then they had every right to ask the FIA. But if they could see it was a green flag and queried regardless then that's my #1 unsporting behaviour by far, and given that I don't see how they could not have seen it was a green flag, I'm going with the latter. Yellow lights were flashing on Vettel's dashboard despite the green flags on the track. The rulebook does not specify what takes precedence when conflicting track status is displayed, FIA ruled that it would be the flags, and Ferrari asked for a clarification on that. The reason dashboard lights were introduced is because drivers may not be able to see the flags in tricky conditions such as in Brazil, so it's not really obvious why the flags would take precedence over the lights. EDIT : And I'm sure you know of the furore caused by the safety car incident last year at Monaco, Schumacher saw the green flags and overtook Alonso but the rulebook said he couldn't. Flag rules leave a lot of room for interpretation, especially in corner cases like this. Like there is no clearcut rule on how much a driver should slow for yellow flags in qualifying, and they don't even slow for them in the race. Whilst the rulebook might not state all this directly, the teams have access to a LOT more information than just what is published officially on the internet. A lot of the time debates erupt here or issues are highlighted by the media when they are actually non-issues. How often do we see a driver overtake outside the boundaries of the track and it ends up in a four page thread only for us to find out that in the driver's briefing the drivers were told it was OK to go outside the boundaries at that point? We don't have access to those things but the teams do. I don't believe for a second that teams have not been made aware of the interaction between flags, lights and dashboards in the past. So for me to accept that Ferrari needed a clarification on this would be to assume they were incompetent. I don't hold Ferrari responsible for the furore in this matter, but I feel that even a private clarification is unsporting. The only clarification I could accept is if they genuinely couldn't see the green flag, which I find hard to believe, but certainly not if they didn't understand the lights, flags and dashboard interaction. Actually, the only item on the list that caused me agita was Ferrari's investigation of Vettel's pass on Vergne. Not because they should not have pursued it - they should! - but the WAY they went about it. Some fellow capture images from in car camera, post it on the 'net with their opinions, frenzy ensues. Ferrari should have inquired - privately! - of the FIA asking for clarification. Where they went wrong was posting to the Twitterverse that they had asked the FIA for 'clarification'. Ok, then, Seb did something wrong and we want to know why nothing was done! Wrong. He did nothing wrong. Ferrari had to back pedal, but the damage was done. Congrats Ferrari PR machine, if Alonso wins it next year they will underline 'deserving' or something in their press releases. Alonso's tweet about 'rules' didn't help, either. It should have been quiet and professional until resolved. Instead it looks like a campaign of besmirchment. I was terribly disappointed in Maranello about how this was handled. The worst offence by far is Red Bull's handling of Mark Webber. The Ferrari incident in Austin to me is no big deal, regardless of its legality (its legal under the rules), at least they were up front and honest about it for a change. I cannot believe that a team such as Red Bull which is so determined to correct any and all faults on Vettel's car, even calling out Renault on public TV over the Alternator failures, seem so unbothered by a KERS failure on Mark's car with astounding regularity. They (Mostly Christian Horner) are adamant that they "let their drivers race", yet we hear "Maintain the gap mark", or "Box, Box, Box" when he threatens Vettel. Just as people were angry with Ferrari when they treated us like idiots saying there were no team orders when they blatently were, I find Red Bull's antics just as bad regarding Mark Webber. The biggest surprise of all for me this year is that, as a Hamilton fan, who this time last year hated everything about Alonso, I now find myself cheering the Spaniard on. You can't blame a team for being smart about how they do things, would you rather them just be blatant like Ferrari is with Massa? That "Box Box Box" call, WAS blatant. Is it the smart thing to do (from RB perspective), definately, but to say it wasn't a blatant call is pushing it a bit. I know it might seem like it sometimes but Vettel is not some sacred cow that every driver has to treat with kid gloves and pull over for. As for Ferrari, they're well within their rights to request clarification, it would have been negligent not to. This is pro sport, dog eat dog, not some happy clappy society where they let the blonde kid through because it fits the script. I'm not sure what Blinky's post has to do with protecting/defending Vettel. Just because Vettel was the driver on the other side here is not relevant to the behaviour of Hamilton or Ferrari. I'm not going to get into debating the Hamilton incident because I don't necessarily agree with Blinky. However, on the issue of Ferrari, I do agree. What were they clarifying? If it was the green flag being waved then it was clear for anyone to see in the video. The suggestion made by the youtube poster was not refuted by other information; he mistakenly missed it when he was watching the video despite the fact that it was there. A non-issue was blown out of all proportion. If you're suggesting that that requires a clarification then as far as I can see the FIA should clarify every single overtaking move on the track. If it was the lights, flag, dashboard situation then they have all the available information on that already. If you're suggesting that that requires a clarification then we should assume that teams have been racing for years without really knowing what is going on on track. Thank you, I just won a hundred bucks. I bet with a friend that if I posted my true opinion in this forum that I would be attacked for doing so, and that the poster would rather attack a dissenting opinion rather than post their own opinion. Friday night, a hundred bucks burning a hole in my pocket, cheers, I'm off to enjoy myself. The friend won't have a chance. BM has no case to answer. There was a marshal waving a green flag! Hamilton unlapping himself while torturing the front runners was wrong. There was absolutely nothing to gain by his doing so at that precise moment. Macca had the timing - they knew Vettel was catching Alonso - but Hamilton became a backmarker racer with his fresh tyres and placed Vettel in dirty air. It was a farce. I don't have a problem with his unlapping himself, it was just that he had to care for the timing of it, as REAL backmarkers do all the time. Since he is rarely one, his team should have directed him. Torro Rosso's jumping out of Vettels way, fair enough having your team mate as wingman but a whole other team? dirty play as far as i'm concerned. I agree entirely with everything you've said. On the issue of the OP's 'unsporting' list - My own 'worst' was the gearbox episode. I'm not a fan of team orders at the best of times, but can understand why when one driver is out of WDC contention team orders would be applied to support their team mate. But this should be restricted to letting their team mate pass or providing good 'rear driver' support IMO. In this vein, I was not impressed when (last year?) Webber's wing was taken away from him to replace Seb's. More recently, Mark's 'call to be pitted' seriously annoyed me at the time - but I can't remember whether he still had a mathematical chance at the WDC plus, although I'm pretty sure it was just to help Seb, I don't think Mark ever confirmed this? Odd, as Mark is normally pretty vocal. Torro Rosso letting Seb pass is also not OK in my book and quali slip-streaming is a problem if it helps one team member when the other still has a shot at being WDC - otherwise, it can't be a problem as all teams can do the same for their remaining WDC contender. Vettel was the childish one there. Alonso said he would have let Lewis through as he was no competitor. While Vettel drove the other McLaren off track. Lewis was faster than vettel why should he stay behind? All of the following events are currently legal, but have riled different parts of the F1 community, so which annoy you, and which do you think are clever uses of the rules? Only one I really think is properly dodgy is Toro Rosso pulling over all the time. The gearbox is questionable but at least a single occurrence and was, as such, outwith the race. One fan's "unsportsmanlike" behavior is another fan's "quick thinking, innovative" strategy. Actually, that is a very good question and I'd love to know the numbers. Are you referring to 2012 only, or to the whole span of time in which they have been driving together? Sorry to harp on about this, but I'm still annoyed about 'gearboxgate'! I can't see how this is much different to Schumi 'parking' his car during the Monaco '06 quali - when Alonso declared that 'F1 is no longer a sport'. Schumi parked his car to improve his own chances in quali (and therefore in the race) - Ferrari/Alonso 'messed' with Massa's gearbox to improve Alonso's grid position (and chance in the race)! But I'm open to being persuaded that there is a lot of difference between these two incidents. That's OK - it's only been 4 hours (the time since your last post that you've remained annoyed). Incidentally Alonso made his 'F1 is not a sport' comment after he was penalised at Monza that year for being in front of Massa on an outlap while Massa was on a flying lap, even though the stewards had no choice but to penalise him to be consistent with the rules and prior decisions. You actually make a very good point that I hadn't considered. Ferrari's decision impacted a number of other drivers on the grid just as Schumacher's did in qualifying that year. There's also another element related to this that I have been thinking about over the past couple of days. In part the reason it was OK for Ferrari to do this was because they were the only ones, but it would have been farcical if every team on the grid had done it or if it was something that was done at every race. One distinction that I can see is that Schumacher was impeding other cars whereas Ferrari's actions weren't, but that's probably more of a regulatory distinction than anything else. Another is that Schumacher was more deceptive and Ferrari came clean, and people do respond badly to deception, but that doesn't necessarily have any relevance to the sporting side of things. So on a moral/sporting level I suppose there isn't as much distinction as reactions to the two incidents would have us believe. Well, if you look at it that way then Ferrari's decision in fact returned to a couple of the drivers who had been affected by Grosjean's demotion the "side" that they had acquired in the qualy, so in that sense it "corrected" the situation. But I think that the two main differences are the ones you were pointing out: what Schumacher did was against the rules and hence illegal, while what Ferrari did was within the rules but exploited a loophole in them; and then they were very open with the stewards about what they intended to do, while Schumacher tried to hide the fact that he had parked the car on purpose (I have been told a couple of stories about how that meeting with the stewards went). One may or may not think that Ferrari was justified in avoiding the "penalty" that was imposed on those starting on the dirty side by making the F1 GP the first race in COTA, but I think the differences in the situations were significant. Two more comments: first, the stewards did not need to give Alonso a penalty in Monza (they only had to take into account that Massa was never close enough to Alonso to be affected by it); and two, Ferrari's gearbox decision only made sense in the very peculiar circumstances of the first Austin GP, so I doubt we will see it again. I stand corrected - memory is a funny thing, I would have sworn Alonso's comments were after the Monaco quali horror, but admit that my memory is v bad ! Edit - Morgana - you're right that Schumi's parking was against the rules, but I still can't see that there was much difference in the result of the two events. I don't see the huge distinction in the situations of Schumacher at Rascasse and Ferrari in Austin on a moral level at all. I objected to what Schumacher did but not what Ferrari did because for me all that matters in Formula 1 is the legality of the matter. In the same way I had an issue with Ferrari using team orders in Germany in 2010 but not what they've done in 2012. This comes down to the way I see Formula 1, which is that I view it as a competition rather than a sport in the 'sporting' sense of the word. It has far too many variables, is far too contrived and there is far too much money involved for it to incorporate the concept of 'sporting'. And in the nature of competition, anything that is within the absolute letter of the rules is acceptable to me. There are times, of course, when I don't agree with the rules, but that's an issue for the rulemakers, not for the individuals who are taking advantage of that situation. This is further complicated by the fact that Formula 1 is a team sport. My view on that has always been that both drivers drive for the team and the team is entitled to do whatever it wants to achieve it's ultimate objectives. I found this thread difficult to answer because I had to really think about what I considered sporting or unsporting if I ascribed those concepts to Formula 1. I didn't answer it on the accepted definition. And for me all that really boils down to is circumstances where a team or driver isn't acting with the purpose of competition (as distinct from in the spirit of competition). Sometimes that is really difficult to know, though, because it comes down to the reasons behind what is being done and that's not always easy to ascertain. Schumacher at Rascasse and Ferrari in Austin were both situations where things were done in the purpose of competition. So on a moral level I have no issue with either of them. As for the Monza 2006 situation, the stewards had, earlier in the year penalised drivers on the basis of them being on an outlap regardless of whether their speed was an impediment to the driver behind so they were being consistent. The issue with Massa not getting close enough is partially because he couldn't get any closer due to the problems with the dirty air. The difference between Rascass and Austin. Austin was 100% within the rules. Why aren't we mentioning Red Bull Flexi-front wings here? Or retarded engine mapping? Or despite clarification Red Bull still trying to blow the exhaust. In fact, Red Bull just trying to bend every rule in general. The fact that people dwell upon that Vettel made 20-something passes in Abu Dhabi is laughable, since 6x 'backmarker' cars are over 2-3 seconds off the leaders pace, while the 2x Torro Rosso's just pull over regardless. Even if Vettel starts 22nd on the grid, take out an average of 3-4 retirements per race from the midfield, there's very little fight in the cars until you reach P10-P11, which is when the Mercedes, Saubers, Renaults, Ferrari's and McLarens come into play. Whilst I think you are being far too 'anti' about RBR/Seb - I agree that better cars could fairly easily make up places (thanks to DRS) against cars that were far slower than them. "Bending" the rules is not the same as "breaking" them. Bending a rule means there's wiggle room to interpret the rule in a certain way, which the powers that be may not have intended. If the guys in charge think it's a problem, they'll remove that wiggle room.